Returning to her roots as a painter made ceramics teacher at BASH Linda Austerberry smile. 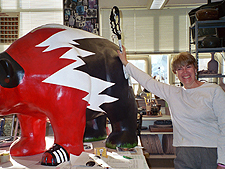 While the girls’ soccer team assisted with the design and production of “Sparky,” Linda provided the expertise throughout their participation and the finishing touches. 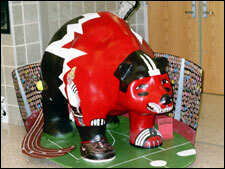 “Growly teeth” were a requirement for “Sparky,” Sugg Chevrolet’s Bear Fever bear, according to BASH art teacher Linda Austerberry who coordinated the girls’ designs and painting efforts. A few features to notice: the stadium which includes photos of the girls on the soccer team. Dreams for an indoor track are represented by the track add-on as part of “Sparky’s” athletics accoutrements. Sponsored by Sugg Chevrolet, “Sparky” tries to capture details dear to athletes. 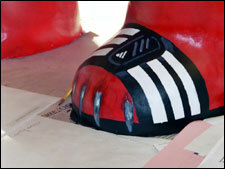 His footwear and his claws are several of artist Linda Austerberry’s favorite features. “Sparky” has an interesting history. He was created by Boyertown High School art instructor Linda Austerberry with the help of the girls’ soccer team sponsored by Jackie and Bobby Sugg of Sugg Chevrolet. Linda’s daughters and the Suggs’ daughters play on the same team.